Heat 12-inch nonstick skillet over medium heat. Melt butter in skillet. Add bread crumbs; cook and stir 2 to 5 minutes or until toasted. Transfer to small bowl; wipe out skillet. Heat same skillet over medium-high heat. Add bacon; cook 5 to 7 minutes, stirring frequently, until crisp. Transfer to plate lined with paper towels. Add beef to bacon drippings in skillet; cook over medium-high heat 5 to 7 minutes, stirring frequently, until beef is thoroughly cooked; drain. Return beef to skillet. Stir in milk, hot water, and uncooked pasta and sauce mix (from Hamburger Helper™ box). Heat to boiling, stirring occasionally. Reduce heat; cover and simmer 10 to 12 minutes, stirring occasionally, until thickened. Remove from heat; stir in cream cheese until melted. 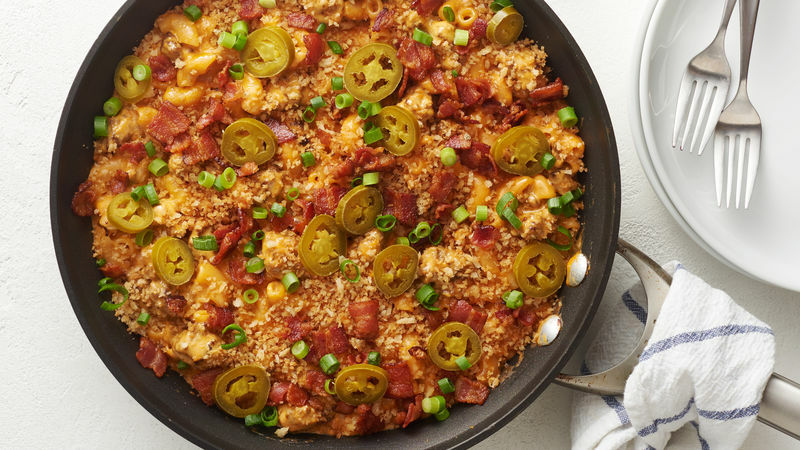 Top with bread crumbs, bacon, jalapeños and green onions. We used regular bacon in this recipe. If you use thick-cut bacon, it will take longer to cook, so adjust time accordingly. Don’t forget to stir the pasta a few times during cooking to prevent sticking.